Soroptimist International has been educating women and girls to lead for 91 years. We all know the saying, artificial “It takes a village to raise a child,” and most of us agree with it. But what about a child who is raising another child, or taking care of a parent or grandparent? Any village—or town or city—anywhere in the world includes children and youth who have taken on a significant caregiver role. In fact, best estimates we have say that 12 to 20 per cent of young people are caregivers, including children as young as five. There is no ‘typical’ youth caregiver. They might attend elementary school, college, or not go to school at all. They may be responsible for shopping, cooking, cleaning, or general household management. They may provide personal care for a family member, for instance helping them use the washroom, administering medication, or carrying out medical procedures such as home dialysis or changing dressings. They may take care of brothers or sisters, work at jobs to pay household bills, manage finances, and act as an interpreter. They supply care for family members recovering from illness or injury, coping with a chronic health condition or mental illness, or at the end of life. They come from different ethnic groups and different socio-economic classes, and each has their own story. The Comox Valley is no different than anywhere else—there are youth caregivers throughout our community, very likely carrying out their work invisibly and with no or very little help. But this is changing: a new program called Youth as Caregivers has been launched, which aims to bring these young people out of the shadows and into the “village”. If we define the word “village” in the well-used saying as “multileveled support network offering friendship, acceptance, understanding, information, skills, and appropriate responses from our social, medical, educational and other services,” then that is exactly what this program is creating. The driving force behind the new program is a man named Larry Winter. Winter knows what it is to be a youth caregiver—he spent his teen years raising two younger sisters. Winter got the idea for the program two years ago when he heard about a similar initiative in the Cowichan Valley. At that point, it was one of only five such programs in Canada (the Comox Valley program is the sixth). Winter had recently retired after spending 32 years as a military police officer. He was already volunteering at the Community Justice Centre’s Restorative Justice Program, and approached them to host a Comox Valley program. When they said yes, Winter got to work. One of his main tasks has been educating people about youth caregivers. There are some common misconceptions that need to be dispelled. Probably the most common of these is the idea that youth caregiving is some sort of “social problem” that needs to be “fixed”. “These kids are not socially disadvantaged. They are learning about responsibility, about relationships, and about reality. They are gaining depth to their self-image and sense of worth. Some have the most deep, moving, life-lasting and rewarding experiences ever imagined. “We are mainly here to give them support and a sense of worth. We want to make the caregiver a better caregiver, which means the person they are caring for has a better life. And if the caregiver becomes better at their job, they have more time to devote to their own life,” says Winter. Most youth caregivers, when asked what they need, will say, ‘We want to be recognized for what we do and how much it costs us’, ‘All we want is some understanding and support,’ and ‘We need some time to be kids,’” explains Winter. “Many young caregivers are in fact doing well, and that’s because they have resilience and support from their families, peers, educators and human service providers. Some aren’t doing well, usually because they don’t have those things,” he says. In such cases, the consequences can be detrimental, and life-lasting. Caregiving is stressful no matter what. It becomes far more so for someone who hasn’t had enough life experience to gain the necessary skills, who is in the midst of negotiating the demands of growing up, going to school, finding their place in their peer group, entering the labor market, and making important decisions about their futures, almost always while keeping their caregiving role hidden. To compound matters, because young caregivers tend to be invisible, they usually don’t get the information, support and training that an adult in that situation would. As a result, these caregivers can find themselves starkly alone. Like all caregivers, they deal with worries that the family member they are taking care of will get worse, that they themselves will be unable to cope, and in some situations that the family member will die. And of course all these things do happen. At these vulnerable times, the young caregivers often have no one to talk to. “Imagine you’re 14 or 15 years old, you’ve taken care of Granny for most of your life. Granny dies. Now you’re the kid sitting in the back of the church blaming yourself,” says Winter. It is not surprising that young caregivers are prone to anxiety, depression, and anger. They often feel torn between their longing for a ‘normal’ life and their sense of responsibility for the health of their family. Many young caregivers fall into a cycle of isolation and developmental delays that is hard to escape. Not surprisingly, an estimated 22 per cent of high school dropouts are youth caregivers. They might be missing school regularly to accompany a family member to a medical appointment, or to manage household duties. They are often exhausted and preoccupied while at school. The lack of school achievement can have life-long consequences for the caregiver. Young caregivers should not have to pay such a price for working so hard, says Winter—and they don’t necessarily have to. Experience from around the world shows that where youth caregiving is recognized and supported, these negative consequences diminish. Winter is inspired by examples such as England, where legislation recognizes and supports young caregivers. This is reflected in the training and practice of educators, social service providers and health care workers. “We are 10 years behind the United States, 15 years behind England and the Netherlands,” says Winter, with a slight grimace. But he is on the forefront of changing that. The Comox Valley Youth as Caregivers program has three main components. The first is a bi-monthly drop-in session for youth caregivers, held at the LINC Youth Centre. This provides a casual, totally confidential format for these youth to meet others in similar situations, and to get to know Winter, who is the only adult in attendance. Once they begin to trust him, they can talk to him about what they need, and he can put them in touch with the appropriate resources. The drop-in first opened its doors in the summer. So far, a few youths have checked it out but no steady group has formed. But Winter is not the least bit discouraged—this pattern has been the same wherever a program like this has started up. Because the program is aimed at caregivers up to 25 years old, the younger participants will benefit from the encouragement and mentorship of the young adults in the group. Also, Winter is always on hand in a steady but unobtrusive way. The second component, called the Resource Committee, exemplifies what Winter means by ‘youth driven.’ This group is made up of young caregivers. Their job is to provide programming for themselves and their peers. Youth often realize they need to gain skills, and Winter can put them in touch with the right person for training on topics like first aid, cooking, nutrition, drug reactions and side effects, how to make a bed with a disabled adult in it, and more. If participants need counseling, they are given a referral to a professional who is known to have some understanding of the realities facing youth caregivers. “We can provide a gateway; we offer options,” explains Winter. The third component is a Steering Committee made up of professionals who work in fields such as social services, health care, law, education, and government agencies. These people are available as resources for the youth carers, and they function as points of connection with the many institutions and individuals connected to the issue. Much of Winter’s work over the past two years has involved creating a network of relationships. “We absolutely need to have all the other agencies on board. So we’ve had a lot of contact with the Ministry of Children and Family Development, Vancouver Island Health Authority, the John Howard Society, Courtenay Rec, and the School District outreach workers,” says Winter. “When we tell these agencies what our program is about, they are then able to identify youth caregivers, because otherwise they don’t know what to look for. A doctor or someone at the Ministry of Children and Family doesn’t necessarily think to ask an adult client, “Who’s taking care of you?” They don’t think to invite the 12-year-old into the room to learn about the care plan. Teachers and principals don’t consider that the reason a student is absent or not concentrating might be their caregiving duties,” says Winter. Winter wants to see youth caregivers not only receive help, but also appreciation for their work. Youth are an important feature of the family caregiving landscape, he points out. Although there are no figures yet for Canada, a study from Australia, a country with a population two-thirds the size of ours, estimates that the labor of young carers saves the health and social service systems more than $18 billion annually. Clearly they are an integral part of our “village” of support—just not the way we expect young people to be. The Comox Valley Youth as Caregivers program costs about $35,000 a year, Winter says—a small price to better integrate and support these young people who are doing such important and rewarding work, often at such cost to themselves. For more information about the Youth as Caregivers program visit: www.comoxvalleyyouthascaregivers.org or contact Larry Winter at 250-334-8108. Former or current youth caregivers are welcome to come to the drop in sessions at the LINC, every 2nd and 4th Tuesday of the month at 4:00 pm. one of the many local women the organization has helped, and her sons Taylor and Shane. If you’ve been a long-time resident of the Comox Valley, you might remember Soroptimist Christmas Puddings. For years Soroptimist International of Courtenay prepared, canned and sold the traditional Christmas dessert for Valley residents to enjoy. A change in provincial processing rules brought an end to the fundraiser nearly 10 years ago, and with it went one of Soroptimist’s most recognizable projects. How recognizable? Well, the group opened a time capsule this past May during the Western Canada Regional Conference commemorating the last time the Courtenay chapter hosted a regional conference, and in that capsule was a Christmas pudding! Today Lynda Willis, president of the Courtenay Soroptimists, wants to bring the organization back to its roots, and raise the profile of a 91-year-old organization of women helping women and girls. When roughly translated from its Latin roots, Soroptimist (so-rop-ti-mist) means “best for women”. The organization was started in Oakland, California in 1921 because women of that time wanting to volunteer in their communities were unable to join men’s service clubs. “We had work to do, so let’s get it done” is how Willis explains the thinking of the earliest Soroptimists. Since then, the organization has grown into a world-wide volunteer service organization for business and professional women who work to improve the lives of women and girls in local communities and throughout the world. The Soroptimists came to the Comox Valley in 1944 under the leadership of charter president of Kay Jancowski. Since then, the Courtenay Soroptimists (now Soroptimist International) have given unwavering support and dedication to women and girls in this community and around the world. Getting a handle on just what the Courtenay Soroptimists do for today’s women and girls, however, is a challenge—they do a lot. Let’s start locally, and work from there. Soroptimist provides seven bursaries for post-secondary education for young women graduating from any of the Valley’s three high schools (GP Vanier, Highland Secondary, or Mark Isfeld). They also provide 10 bursaries for women attending North Island College. That number makes Soroptimist one of the larger bursary providers in the Valley. Then there is the annual Yes You Can Mentoring Day for young women aged 16-18. The event brings together young women at risk of not completing their education (and facing all of the challenges that come when you don’t have a high school education) with professional women able to provide encouragement and advice. So the Soroptimists decided to bring together a variety of professional women—from women in the military to police officers to dental hygienists to business women—to discuss how they went about achieving their career goals. “This is about showing young women these things are actually possible, and where to go to find these things,” says Willis. What Soroptomists have found is many of these young women simply need a role model to show them how to make their own educational and professional dreams come true. It’s a role members and guest speakers are happy to play, and something they are thrilled to facilitate. The girls leave with gift bags filled with donations from local businesses. The organization has supported the Mentoring Day for the past four years, and has made it a priority project. A comparable event for women is the Successful Dressing event, which gives women transitioning back into the workplace—or without the resources to purchase professional clothing—the opportunity to build a work wardrobe. Unfortunately, the demands of hosting the Western Canada Regional conference means the event wasn’t held in 2012. Willis hopes it will happen again next year. Next up for the Soroptimists is the annual fundraiser, Woman’s Day. The event brings together women to have fun, socialize and raise money for the many projects the group supports every year. The next event will happen Sunday, February 24, 2013. The main event will be a theatre day with Kymme Patrick of Theatre Works. The organization’s more charitable work includes Soropti-paks and Christmas gift packages for two of the Comox Valley Transition Society’s programs for homeless women and women and girls at risk in the community. “Soropti-paks are given to women in transition,” explains Willis. “That’s one of our really important projects.” The packages include all of the household items—from bedding and towels to kitchen supplies—that are needed to start a household. The Christmas gift packages are very similar. The baskets are usually stocked with hygiene items like soap and toothpaste, along with essentials like socks and accessories to keep warm over the winter. Finally, the Soroptimists support the RCMP Boot Camp for Youth, Comox Valley Hospice Society, Therapeutic Riding Society, Lake Trail Neighborhood Connections project, Comox Valley Senior Peer Society Counseling Society, and the Stepping Stones Recovery House for women. That list, of course, is only the organization’s local work. Soroptimist International of Courtenay also participates in two of its parent organization’s signature projects: the Women’s Opportunity Award and the Violet Richardson Award. Willis is particularly proud of the Women’s Opportunity Award. A local recipient receives $2,000 and can go on to win a regional award and an Americas award of $5,000 and $10,000 respectively. A successful applicant could receive a total of $17,000 from the Women’s Opportunity Award. The recipient of this award, Willis adds, is “usually a single mother trying to get herself back on track and they usually have incredible stories. 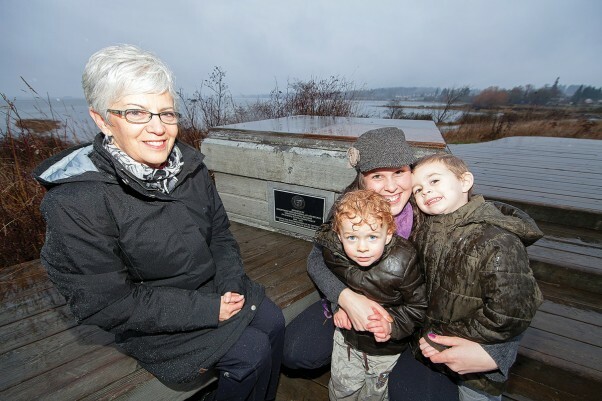 Take for example one of the Comox Valley’s most recent winners—a young mom of two kids. She was a straight-A student in high school but fell in love and decided to forgo post-secondary education for marriage and family. Unfortunately, the marriage didn’t work and she was left with a choice—social assistance, or educate herself to be employable. She chose education. In contrast, the Violet Richardson Award recognizes girls who are working to improve the lives of women and girls through their volunteer work. The award is named after the founding member of Soroptimist International. Local winners are given the opportunity to be considered for the regional award, while regional winners are then eligible for the America’s award. Both awards provide financial support for the winner’s charitable organizations. If you were to sum it up, Soroptimist is about women at their best working to help women be their best. Which, believe it or not, brings us back to the Christmas pudding. Willis is a 20-year member of Courtenay Soroptimist International, and she remembers making the Christmas puddings—though she remembers it a bit like an episode of the Lucille Ball Show. Everybody got together at the old Glacier View Lodge; some women mixed the pudding, some put it in the canning jars, others processed the cans in the hot water canning bath. Hilarity usually ensued. What stands out for Willis is the camaraderie of women working together. Courtenay Soroptimist International meets every third Monday (September to June) in the Evergreen Lounge at the Filberg Centre. For more information visit www.soroptimist.org. To donate to the Soropti-packs or Gift Baskets, contact sicourtenay@soriptimist.net. Non-member volunteers are also welcomed at events.